NVMe-based Solid-State Drives (SSDs) storage can utilize a PCI Express (PCIe) interface to directly connect to the server CPU and function as a cache accelerator allowing frequently accessed data, or "hot" data, to be cached extremely fast. High-performance PCIe-based NVMe SSDs with extremely efficient input/output operation and low-read latency improves server efficiency and avoids having to access the data through an external storage device. NVMe SSD server acceleration is ideal for high transaction applications such as AI acceleration or database queries. PCIe-based NVMe SSDs not only reduce power and cost but also minimize area compared to hard disk drives (HDDs). 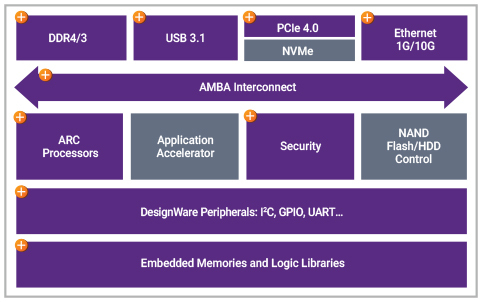 Synopsys’ portfolio of DesignWare interface IP in advanced foundry processes, supporting high-speed protocols such as PCI Express, USB, and DDR, are optimized to help designers meet their high-throughput, low-power, and low-latency connectivity for cloud computing storage applications. Synopsys’ foundation IP offers configurable embedded memories for performance, power, and area, as well as high-speed logic libraries for all processor cores. Synopsys also provides processor IP ideally suited for flash SSDs. DDR memory interface controllers and PHYs supporting system performance up to 4800 Mbps, share main memory with compute offload engines plus network and storage I/O resources. High-performance, low-latency PCI Express controllers and PHYs supporting data rates up to 32GT/s to enable NVMe-based SSDs and SD Express Cards. Complete USB IP solution reduces engineering effort while reducing area. NRZ and PAM-4 Ethernet PHYs and configurable controllers compliant with IEEE standards support data rates up to 400G Ethernet to enable high-speed storage applications for data center networking. Low latency embedded memories with standard and ultra-low leakage libraries provide a power- and performance-efficient foundation for SoCs. Highly integrated, standards-based security IP solutions enable the most efficient silicon design and highest levels of security.